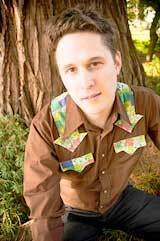 Kenny Feinstein has recently emerged from the School of Music at the University of Oregon. He received his degree in Jazz performance on the guitar. Aside from having a deep understanding of music theory he has a natural love of playing and teaching music. Kenny is a student and teacher of mandolin, banjo, harmonica, bass, and fiddle. He is skilled at old-time, bluegrass, country, folk, cajun and blues. Feinstein is a founding member of the Water Tower Bucket Boys who learned from the PSGW greats and now tour the world playing high-octane traditional and original music. Kenny teaches children how to play music at the Willobrook Center for Development of Human Potential in Tualatin, Oregon and is a staff member at two local music academies in the greater Portland area. He started coming to PSGW in 2004 and has been attending ever since.